Designer Cherry Sahni & Raghav Sahni mesmerized the audience at The Grand Hyatt of Mumbai with their stunning collection of jewellery inspired by “Tassels” at the 2nd day of India International Jewellery Week, 2015. Amidst the grand set up of blue Moroccan street, their show stopper Aditi Arya walked the ramp in a quintessential yellow diamond neckpiece. So phisticated, Simple, Stunning are three words that best describe the visionary jewellery brand. The eclectic collections of fine, design-led jewellery pieces take as their credo handcrafted elegance entwined with minimal, pure lines, simplification of design, precise attention to detail, and versatility of form and materials used. The collection reflected cherry’s pulse on fashion, offering modern, unique, iconic and edgy designs that make a statement. 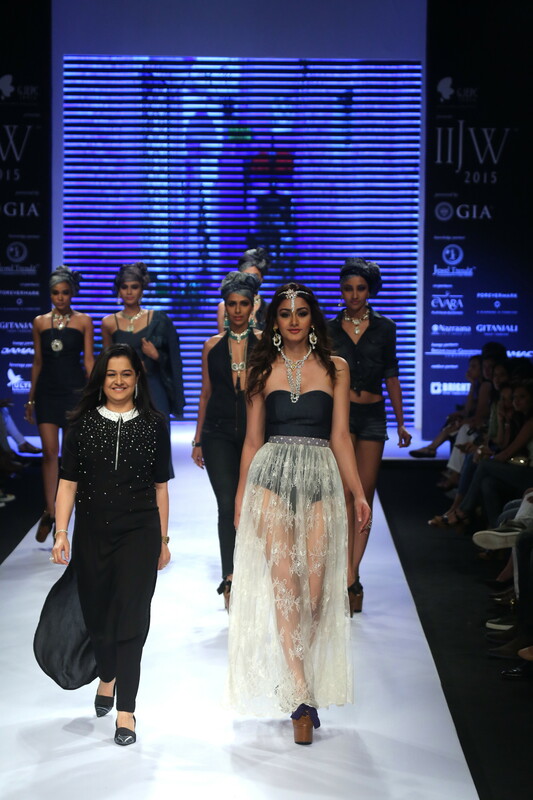 “A tuft of loosely hanging jewels knotted at one end to adorn your being forms the underlying concept of my collection”, says Cherry Sahni. The collection found its inspiration in the nuances of mughal period and tassels coupled with the use of high-quality materials and gemstones to create niche jewellery; each piece had the USP of being contemporary, diverse, and uniquely transformable into a variety of adaptable forms. In quiet atypical manner, it was restoring to see models pairing traditional jewellery with denims; the whole idea was to cater to those women who want to explore the world, are not bound by restrictions, and believe in the unconventional, thus defining an art form in itself. A tassel is a bunch of loose threads or cords bound at one end and hanging free at the other; it is a universal ornament that is seen in varying versions in many cultures around the globe. Picking tassels for an outfit is an art; they give a fun and playful feel to the overall attire and look. Over the eras tassels have undergone a major reformation and certainly for the good. Diamondtree’s tassel line offers a holistic service to its clientele, whereby it creates striking, authentically-certified jewellery pieces, with a dedication to quality customer-service and after-care of each precious item. The jewellery is crafted keeping the current trend of tassels in mind and intertwining it with the mughal era giving it a blend of royalty with the latest edge. 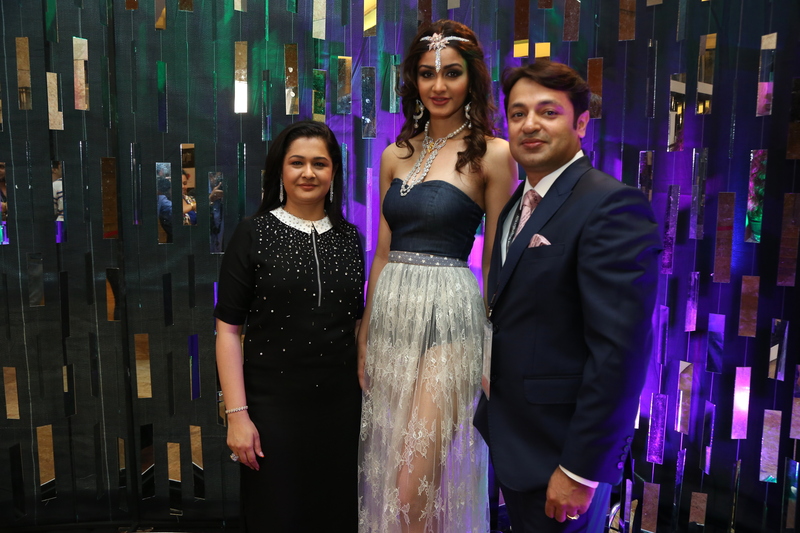 Raghav and Cherry Sahni together founded ‘Diamondtree’ with a dream to create a brand that would offer the finest quality of diamonds and mesmerizing jewelry. The idea is to skillfully orchestrate a sense of style in pieces that not only have great sentimental significance in lieu with today’s trends, but also inspired by authentic traditions from all over the world and creates masterpieces to match your style and grandeur. Each piece is specially handcrafted to give nothing but the best and to bring the gorgeous style to everyone and anyone who admires jewelry.